Many of Zynga's games depend on "Energy" to play, and you're always going to hear fans wishing they had more of it. But Treasure Isle has a feature that lets you grow your own Energy -- the Small Garden. Everyone gets two of these at the start of the game. You use them to grow fruit from seeds you buy at the store, then you can harvest the fruit for Energy. Normally, you can buy another Garden Plot for 70 Island Cash, but now there's a way to get one for free! 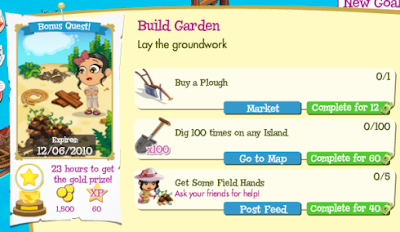 The latest bonus quest, called "Build Garden", has three tasks for you to earn you a free, extra plot. First, you buy a Plough, which you'll find in the Store under "Decorations" for 500 Coins. Secondly, you need to make a hundred digs anywhere you like. Finally, you'll need to get five people to click on your Facebook posts to "Get Some Field Hands" (a.k.a. your fellow Treasue Isle players) to complete the quest. You can also finish the quest by paying 112 Island Cash, but since you can buy a plot for 70 Island Cash, it's obviously better to do the work yourself. The "Build Garden" bonus quest is set expire on December 6th, so finish it while you can. What do you think they can do to improve ?! As one of the treasure isle maniacs, it is obligated for us to think, suggest, and share our thoughts and suggestion. We all know that it is a game, but not any game, it is the one who make us addict, spend a lot of time playing it, and trying to level up more and more. But, as we all know, there are some game's annoying issues that hinder our enjoyment of the game. The Question is what do you they as game provider can do in order to improve this game ? !